Performers include: Seth Meyers (host) and The 8G Band with Fred Armisen. The anchor of Saturday Night Live’s “Weekend Update,” Seth Meyers, takes over for Jimmy Fallon as host of the fourth incarnation of the Late Night franchise. As has become the norm, episodes open with a monologue and include comedy bits, interviews with celebrity guests, and performances by musical guests. The first guests were Meyers’ former Weekend Update co-anchor Amy Poehler and Vice President Joe Biden. The first musical act was A Great Big World. What do you think? 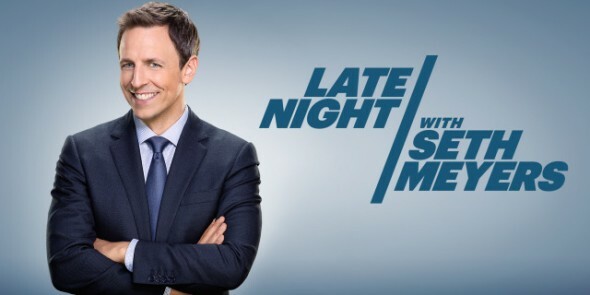 Do you like the Late Night with Seth Meyers TV series? Do you think it should be cancelled or renewed for another season? More about: Late Night with Seth Meyers, Late Night with Seth Meyers: canceled or renewed? Hi folks. 1 suggestion. Its time to get better writers iso friens from snl. Truth be told the jokes rarely get a laugh.. Unless canned laughter cts. Weakest part of whole show. Look at your own clips and see seth struggle with. Bad or poorly timed jokes. Good luck. Seth Meyers is really smart. It’s lovely and so entertaining to hear an intelligent comedian and commentator who isn’t snarky or nasty. He’s very forward thinking. Love him. He was SO good on SNL, he never should have left. One can only take so much of his whiny, nasally voice. Short segments were OK, a whole show? Nope. Definitely should be canceled. The show is low class and not entertaining at all. Nothing but bashing the president. Cancel….. not funny…. don’t understand how he ever got a show in the first place… now he is unhinged. Cancel. He can’t make any jokes unless it’s political or bashing the president of the United States. I used to like the guy on weekend update, but his late night rhetoric is boring and over done. He’s a flop, not even close to what Jimmy Fallon did in that spot. Get a new host with less of an agenda and the show will be good again. Found Seth Meyers long and tedious political rant last night neither particularly entertaining or amusing, just plain mean and boring. Late night shows are best when they furnish casual, relaxed, banter. However, Meyers obviously desires turn the show into a hard edged political attack platform attempting to educate his audience into his rather narrow point of view. Had no idea that this so called comedian was also some great political professor and social scientist. In this, he’s no Will Rogers either. After the news, The Tonight Show comes on. I really don’t watch it because I’m doing other things. THEEEEENNNNN, when The Late Night Show starts, it will startle me out of a deep sleep. I can’t stand him. He preys on our President every single night for his monologue. I’m not sure what he’d talk about if President Trump wasn’t our President. I can’t believe NBC lets this to continue. Unreal! Please cancel the show and bring in someone worthwhile. Watching Seth Myers 20 minutes into the show 1/20/17 and hearing him criticize and insult our President! Shame on NBC for allowing him to read his “script” showing such disrespect. I will no longer watch NBC. Please cancel this show. Don’t watch this show anymore. I thought late night shows were designed for light entertainment & to lighten a persons mood after a long day. This is not the platform for constantly forcing his personal political views on the viewers & attacking his guests. What graceful host attacks their guests in this public format? (Remember the Rosie O’Donnell show?) Seth Meyers isn’t funny or entertaining. Can’t believe he has a show. There are many people more qualified than him who know how to entertain.